Next stop: Half Moon Bay, some 30km from Khobar. Our otherwise-totally-out-of-date Lonely Planet guide said that this was a pleasant spot for expatriates, and the beach one of the most beautiful in the area. Getting out of the car, I narrowly missed stepping on a discarded disposable nappy which had not quite made it to the bin. Actually, there were no bins. Saudis don’t do rubbish bins. Instead, they leave their rubbish for Third World nationals to pick up after them. Shame, then, that there were none here. Back on the beach, families sat and picnicked, children and men swam, while the women sat and watched. All on a beach covered in rubbish. As for expatriates, there were none. Well, no, wait. We were it. That’s probably why the man offering camel rides made a beeline for us. And the man offering donkey rides. And the man with the horses. And the young lads leaning out of their car windows waving furiously as they coasted by. If we’d been any more popular, we’d have been signing autographs. I was definitely up for a camel ride. We paid 20 riyals (for two rides) and then I clambered inelegantly upwards. I sat there, precariously balanced, on a seat somehow strapped onto the top of the camel’s hump. Chasing away thoughts of just how far it was to the ground from this height, I sailed off into the wind. Well, almost. Truth be told, it was more of a lurch than a sail. Camels are cumbersome creatures. No such lurching for the young Arab who charged past us, riding on his glossy horse. Friday arrived, and it was time to drive back to Riyadh. We were returning via Hofuf. The name Hofuf means ‘the whistling of the wind’. Our guide book claimed that Hofuf would be arguably the highlight of our trip, with its green oasis, historic souk, fort and white mosque. Ah, there goes that Lonely Planet guide again. I wonder if it was also responsible for our misguided GPS? 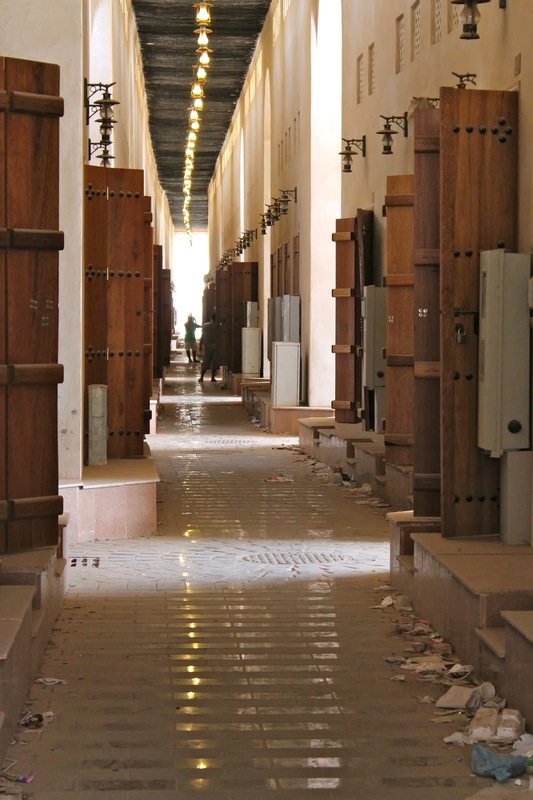 The souk, rebuilt after a fire in 2001, did not sell the hand-made Arabian coffee pots or the collections of Bedouin jewellery our guide book had suggested. It was in fact completely deserted. And not just deserted – never inhabited. The only thing moving was the litter, blowing down the narrow alleyways and gathering in unswept piles. The fort was forgettable, and we completely missed the mosque. We set back for Riyadh and the four hour trip through the desert. The landscape was stark and the sand endless. We took numerous photos and quickly became very adept at tucking our cameras out of sight every time a security road block was spotted ahead.